Haitians are desperate for help. But they don’t want it from the American Red Cross. As Hurricane Matthew churned toward Haiti at full force last week, France Francois knew she was powerless to stop the impending natural disaster. But with time running out, the 30-year-old Haitian American thought she might be able to help the island nation avoid the man-made disaster that she expected to follow. Before the storm struck, Francois, a former development worker in Haiti, turned to Facebook and composed a list explaining how people could help the hurricane-ravaged country. Her first instruction: "Don't give to the American Red Cross." Instead, she wrote, people should send money to "Haitian-led" organizations and "not your missionaries and useless college kids." "We wanted to highlight the fact that there are local organizations on the ground that can mobilize quickly and more effectively than an organization parachuting in from Washington or Europe," the Miami resident said in an interview from Panama, where she was visiting when the storm struck. "Organizations like that take time and resources away from the people who are suffering." In recent days, her post has been shared thousands of times — in part, she believes, because it tapped into a growing consensus among Haitians and Haitian Americans that the American Red Cross can no longer be trusted to effectively manage humanitarian efforts in the Caribbean nation. Those feelings have been bolstered by a widely circulated investigation by NPR and ProPublica, which found that the Red Cross grossly mismanaged its response to Haiti's 2010 earthquake, one of the worst natural disasters in the history of the Western Hemisphere. A Red Cross spokeswoman said the organization has raised $3.3 million "in designated donations and pledges for Hurricane Matthew." "We do not know if calls to avoid donating to RC have damaged our fundraising efforts, but we are concerned that it could hurt our fundraising, as well as that of other international aid agencies, which would be a tragedy for Haiti," Suzy DeFrancis said. Published last year, the NPR and ProPublica investigation found that, despite collecting nearly a half-billion dollars in donations, the Red Cross managed to construct just six permanent homes. Over the weekend, NPR and ProPublica's investigation — and subsequent articles about its findings — were resurrected on social media, where they attracted the attention of celebrities, journalists and potential donors. In response, Gail McGovern, the president and CEO of the American Red Cross, published a lengthy blog post on Huffington Post that acknowledged the "persistent myths circulating online" about the American Red Cross response to the 2010 earthquake. She blamed those myths on "the misleading headline of a story written by ProPublica and NPR in 2015," which, she added, is again making the rounds "in the wake of this latest disaster." "It creates the false impression that the only thing the American Red Cross did with $488M in donor money was to build six homes — when, in fact, we have funded 100 different humanitarian aid projects in Haiti," McGovern wrote. "It would be a shame if myths circulated online by people who want to help Haiti, actually end up hurting relief efforts," she added. Haiti’s national Civil Protection Agency, which oversees disaster management across the country, has increased the death toll from the hurricane to 473, but that seems likely to grow, and some estimates put it at more than 1,000, according to reporting by The Washington Post's Joshua Partlow. Speaking to reporters Friday, President Obama told Americans to help Haitians by going "to the American Red Cross," reiterating a standard relief message that exasperates many in the global Haitian community. Because of the country's reputation, relief workers say, many Americans assume Haitian organizations are inefficient and corrupt, making the American Red Cross a comparatively safe alternative for donations. But it appears that trust in the organization may be eroding. In small seaside and mountain villages dotting Haiti's devastated southwest peninsula, the Associated Press reported that frustrated locals pointed to nearby helicopters and wondered why they hadn't received more assistance. Israel Banissa, a carpenter who lives near the small mountain town of Moron, told the AP that a Red Cross assessment team dropped by the village to speak to people, but left without providing supplies. 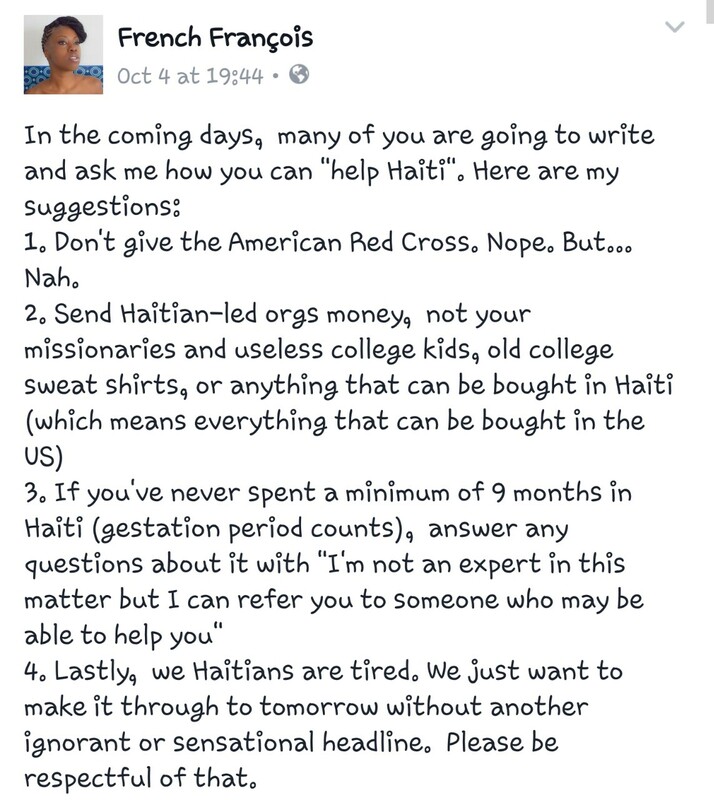 Like Francois's posts, outrage directed at the Red Cross has also led numerous aid workers to speak out, often in detailed Facebook posts, highlighting the damage that well-meaning but culturally naive foreigners have inflicted upon Haitians in their efforts to assist. Hoping to help people bypass foreign relief agencies, Woy Magazine, a popular Haitian publication, posted on Facebook the contact information of coordinators working for the Civil Protection Agency. The magazine recently posted an article exploring what Haitians should say when foreigners ask how they can help the country. Others with experience working in the country, such as Cleve Mesidor — a Haitian American and former director of public affairs at the U.S. Commerce Department — have shared lists of trusted Haitian relief organizations. I do not recommend contributing to non-Haitian entities. This includes those U.S. organizations who claim to be 'locally managed,' which is code for powerless figurehead. Most of these entities are based in big cities like Port au Prince, which are not located near the affected neighborhoods. These non-Haitian organizations will likely use your funding to resource their non-Haitian teams for the long trip to the affected communities (SUV, gas, etc.) and set up camp. They will likely need to find accommodations for themselves (place to stay, maid to cook their food, etc.) while 'tent-cities' pop up for locals. Andye Laroche, a Haitian American who works in international development, said if outsiders really want to help Haiti, they should consider visiting the nation — but not as Red Cross volunteers. "If you badly want to go to Haiti, feel free to go for tourism purposes," she wrote on Facebook. "Yes, tourism! Haiti has the largest fortress in the Americas, a vibrant culture, pristine beaches, and let's not even talk about the Haitian food, yes food not trees, that will have you coming back for more!" "Go and spend your money in locally owned hotels/beds and breakfast, on the beautiful art, and fuel that economy!" she added. Reacting to negative tweets about the Red Cross response in Haiti, the Canadian Red Cross tweeted links to a page with updated figures and a long explanation of the Hurricane Matthew response. At the bottom of the page, the organization linked to its own donor report for the 2010 earthquake, which notes that the organization built 7,500 new homes for Haitians. Recent Red Cross tweets are full of images showing concrete relief efforts on the ground, as if to preemptively dispel any skepticism about the agency. Roger Annis, a co-coordinator with the Canada Haiti Action Network, told the Globe and Mail that he fears lingering controversy surrounding the American chapter of the Red Cross will damage the latest emergency assistance effort. “If people are concerned about the long-term sovereignty and capacity of the country of Haiti to develop its own resources, I would recommend against the large charities, which in my view just perpetuate the conditions of poverty and of political instability that cause the country to be so vulnerable in the first place," Annis said. Samuel Darguin, executive director of an aid group called the Haitian American Caucus, said smaller organizations are often better prepared to deal with disasters in Haiti because of their relationships with affected communities. When Haitians get relief from people who look and speak like them, he said, they're more likely to invest in lasting rebuilding efforts. Knowing who to coordinate with in communities can be crucial amid the chaos of a disaster, he said, and having a practical understanding of the terrain can determine whether people live or die. "A Haitian organization is more likely to understand logistics and how to reach remote communities," he said. "In mountainous regions, we know the roads and how, for example, to move supplies from large trucks to pickups to motorbikes to hiking on foot, and that can only come from being on the ground for a long time." This week, Darguin, who grew up in New York, found himself in a tiny community outside Les Cayes, one of the areas hardest hit by Matthew. Having spent his summers in the area as a child, it was a community he knew well. "An older woman who knew me as a child came up to me and said, 'Who would've thought that the first person who came to help me is someone whose diapers I changed as a baby?'" Darguin said. "She said, 'I used to hold you in my hand and feed you.'" "For her to see me and know my family, and for me to be the first person to get to her, it was a very powerful moment," he added. "She knows that when I leave to go to the city for supplies, I'll actually return."